[Dickel] always liked tracked vehicles. Taking inspiration from the ‘Peacemaker’ tracked vehicle in Mad Max: Fury Road, he replicated it as the Mad Mech. 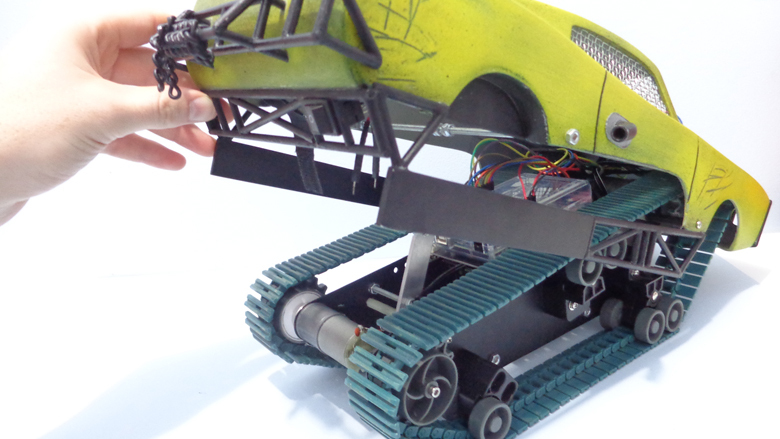 The vehicle is remote-controlled and the tank treads are partly from a VEX robotics tank tread kit. Control is via a DIY wireless controller using an Arduino and NRF24L01 modules. The vehicle itself uses an Arduino UNO with an L298N motor driver. Power is from three Li-Po cells. The real artistic work is in the body. [Dickel] used a papercraft tool called Pepakura (non-free software, but this Blender plugin is an alternative free approach) for the design to make the body out of thin cardboard. The cardboard design was then modified to make it match the body of the Peacemaker as much as possible. It was coated in fiberglass for strength, then the rest of the work was done with body filler and sanding for a smooth finish. After a few more details and a good paint job, it was ready to roll. There’s a lot of great effort that went into this build, and [Dickel] shows his work and process on his project page and in the videos embedded below. The first video shows the finished Mad Mech being taken for some test drives. The second is a montage showing key parts of the build process. You may remember seeing the golf glove air guitar hack last month. Here’s two more uses for gloves with sensors on them. On the left is a glove interface with flex sensors on each digit as well as an accelerometer. The VEX module reads the sensors to detect sign language as a command set. A shake of the hand is picked up by an accelerometer to delineate between different command sets. See it controlling a little robot after the break. This comes from [Amnon Demri] who was also involved in the EMG prosthesis. Straight out of Cornell we have the SudoGlove, seen on the right. [Jeremy Blum] and his fellow engineering students bring together a mess of different sensors, sourcing an Arduino and a XBee module to control a small RC car with added lights and a siren. There’s embedded video after the break. You may want to jump past the music video for the description that starts at about 3:52.